If you drew a Venn diagram of the people who support Bernie Sanders and the people who use Tinder, you’d probably end up with a circle. 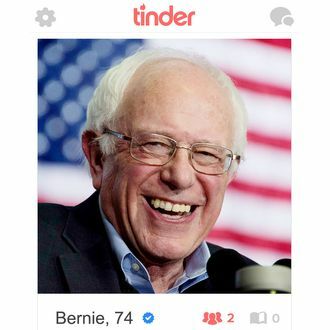 Sure, there’d be a few aged-hippie outliers, but it’s a fair bet that most of Sanders’s millennial supporters have at least downloaded the dating app, and some are using it to campaign on his behalf. Robyn Gedrich, 23, told Reuters she’d sent the message “Do you feel the bern? Please text WORK to 82623 for me. Thanks” to up to 60 users a day for the past two weeks — until her account was locked. In fact, many of the people who’ve been flooding Tinder chats with pro-Bernie messages have found themselves unable to log back in.